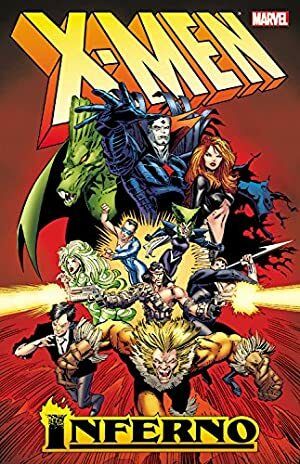 Appearing in 1986, Riptide was one of the mutant killers on the mass-murdering Marauders team working for Mister Sinister. Eyes: Blue Hair: Greyish white. Riptide is another coldblooded, psychopathic killer. 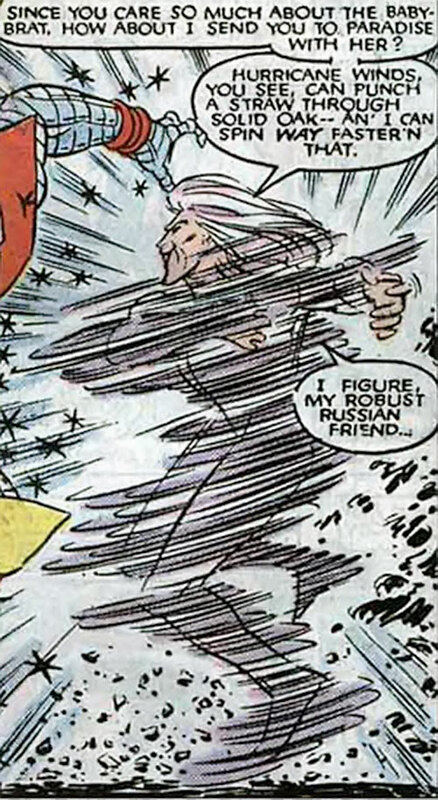 He possesses the mutant power to spin his body at superhuman speeds. He normally uses this while throwing a deadly array of shuriken, knives, spikes, etc. against an opponent or a group of opponents. His speed while throwing these weapons is so great that there are few beings who can resist being penetrated by them. When he is involved in the battlefield the area is usually showered in the thrown and deadly weapons often being followed by screams of pain from the victims. It should be impossible for Riptide to carry the large amounts of throwing weapons he uses in combat. 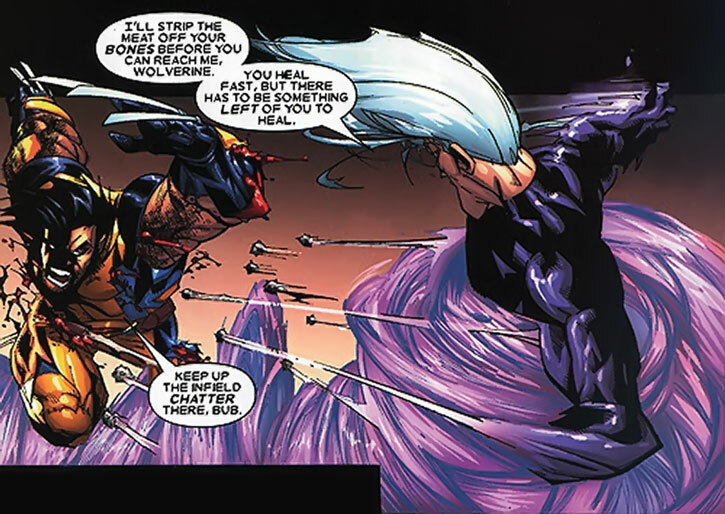 Thus, the creation of the weaponry probably is part of his mutant ability. As with most Marauders very little is known about man called Riptide. His way of talking implies a wealthy origin, but it may be just what he tries to make people believe. He first turned up during the Morlock Massacre being a member of the Marauders team. 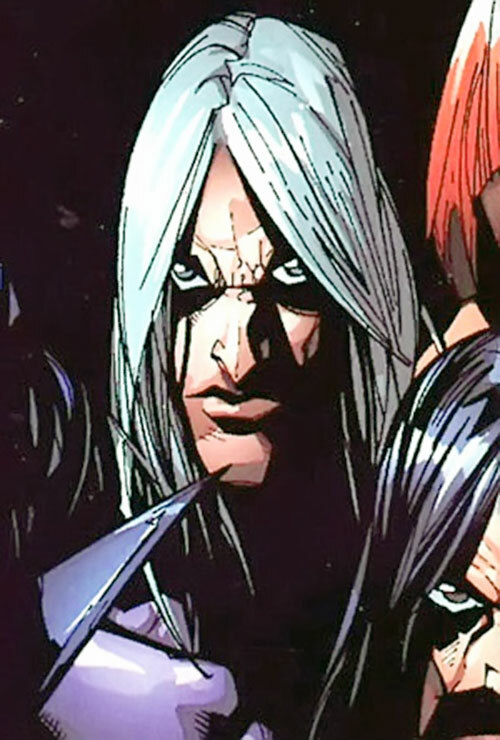 As with the other Marauders he was contacted by Gambit who then was working for Sinister. Apparently he happily joined the team and killed many Morlocks during the massacre. 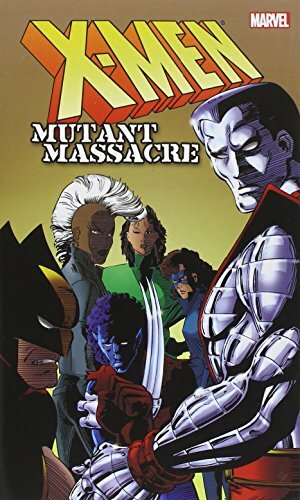 His life ended when he fought the X-Man Colossus who broke his neck as a last-resort way of stopping him. Riptide alias Janos Quested has since been seen again alive. As with many of the other Marauders Sinister had cloned all of them several times over. Most probably this killer will turn up again in the future. Riptide is a quite tall lean-built man. He usually wears a completely white skintight uniform covering everything except his hands and head. In the hands are often seen a pair of shurikens soon to be thrown against an opponent. His hair is long and volumious with stripes of both grey and white. When he begins to spin his features begin to to form a whitish blur except for his facial parts which always are clear and visible. He always tries to make snide remarks and is often seen with an arrogant expression on his face (which infuriates many opponents). Riptide never stands still, but at all times can be seen as a blur while spinning around; sometimes even slowly. Riptide is an insane man. While in combat Riptide laughs like a maniac as well as looks insane. 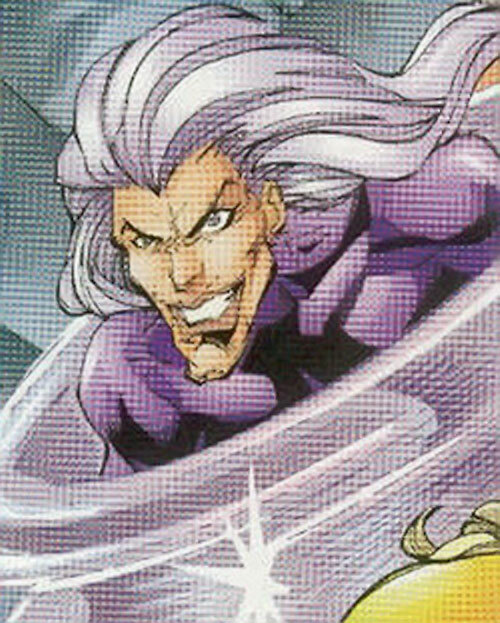 He believes his powers make him invulnerable against the attacks of others and may even stand right before an opponent gloating while simply spinning around. His overconfidence may easily lead to his defeat as he thinks he is capable of defeating anyone. He doesn’t care about his opponent one bit, but will rescue another Marauder in need of help. Riptide couldn’t come up with a plan of his own and instead follows the orders of Sinister or the team leader at all times. He talks in a way that implies or tries to imply that he’s of a wealthy origin, but this probably is a ruse. 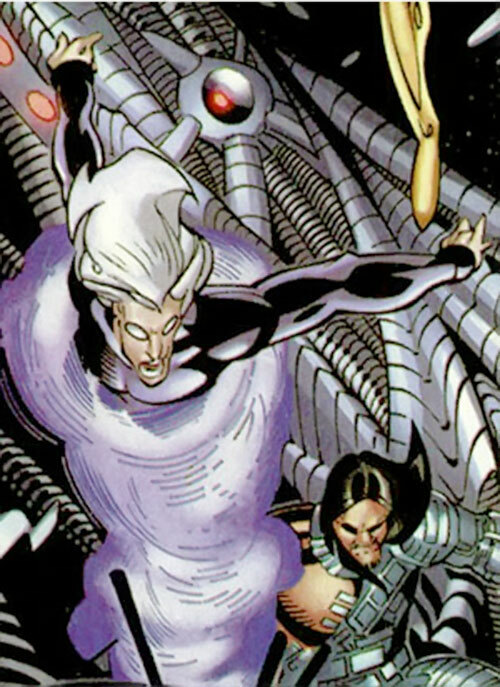 Riptide is another mutant assassin (how many are there really?? ), but would probably not care about who he hunts. 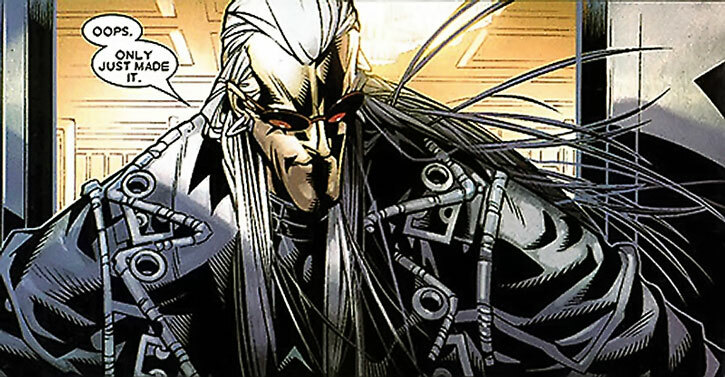 He could probably be employed as an assassin for hunting down metahumans, together with the other Marauders, under the services of a mysterious and powerful villain such as Darkseid. 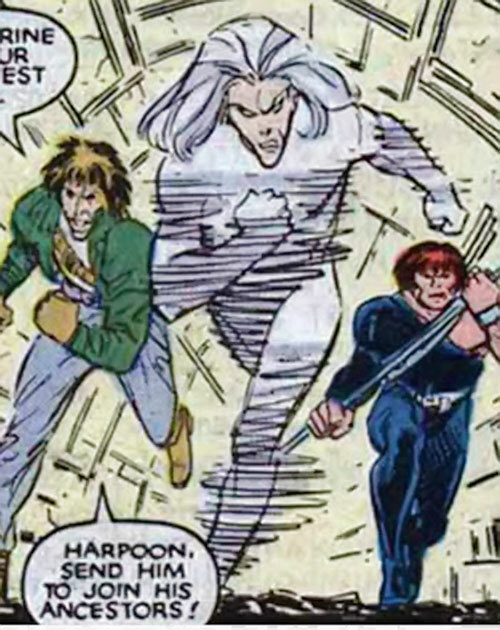 Riptide doesn’t care about his origin and could be either a mutant or a metahuman. A nice thing is that the Marauders can return even after their apparent demise as Sinister readily clones new ones; Marauders that again are ready for new tasks. Claws and Projectile Weapons are Contingent upon Superspeed. Superspeed may not be used for movement. If you think he’s as wealthy as claimed, increase the Resources to 008 APs and add the Connoisseur Advantage.